We would love to hear from you! Send us an email to let us know more about you, your graduation year, and what you are doing now. Please send the email to alumni@smadanvers.org. We look forward to hearing from you! Congratulations to Caroline Lucy, an SMA Alumni, Class of 2010, who has been initiated into The Honor Society of Phi Kappa at Fordham University and to her brother, Andrew who is also an SMA Alumni , Class of 2011, who completed his research project "Assessing Opportunities to Recycle Urban Waste in Tirana" through the Worcester Polytechnic Institute in Australia. Lily Brown (left), one of our alumni from the Class of 2017 and a freshman at Bishop Fenwick High school is a national award finalist for a letter she wrote to Lisa Fenn, author of last Summer's One Read, "Carry On". Out of the 140 students who wrote letters, 16 competed in the reading and writing contest. After being judged at the local and state levels, their letters moved on to compete in the national Letters about Literature Contest. Congratulations goes to Lily Brown for writing a letter that is among the top 1.5% of all letters received from high schools across the country. 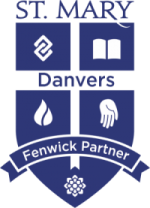 The contest winner will be announced in April and certificates of recognition will be issued to the 16 Fenwick students who participated. Congratulations Lily! Matthew Collins (left), St. Mary of the Annunciation, Danvers graduate and senior at Bishop Fenwick High School has been awarded the Bishop Medeiros Scholarship to Boston University. This a four-year, full-tuition award available to selected graduating seniors from parochial high schools in the Archdiocese of Boston. Recipients are chosen for academic achievement, leadership ability and dedication to community service. Students must be nominated by their high school principals or guidance counselors. Congratulations to St. Mary's altar server Joie Dillon (left) who received the Blessed Mother Teresa of Calcutta Service Award at the cathedral of the Holy Cross. The award acknowledged four altar servers in the archdiocese who have exhibited exemplary character of service to God and His Church. Joie has been an altar server at St. Mary's for eight years and is a leader in our youth ministry. A Girl Scout since second grade, she is a recipient of the Bronze and Silver awards and has volunteered regularly for the Sisters of Notre Dame and the Wenham Museum. As an honor student and active campus minister at Bishop Fenwick High School. Joie started the program, Healing Hearts, which provides prayer squares for the Kaplan Family Hospice House. She is currently teaching both students and faculty members how to knit prayer squares. Congratulations, Joie, and thank you for your wonderful example of stewardship to your parish, school and local community. She is now attending the College of the Holy Cross. Amy Geraghty — now the Gloucester High Marine Corps JROTC program’s executive officer and its second in command behind her friend and commanding officer Abigail Francis — will receive an award that recognizes how far she has come in the corps and school alike. She will be presented with the Region 1 Legion of Valor Bronze Cross for achievement. The award is the highest honor that can be bestowed upon a Marine Corps ROTC cadet, recognizing the student’s academic standing and a demonstration of “exemplary military leadership,” according to a national listing of JROTC honors. It is also an honor presented to just one cadet per district, with Region 1 — one of five districts across the country — covering programs in more than 58 high schools from Maine to the Virginia-North Carolina line, noted Richard R. “Gunner” Muth Jr., a retired Marine Corps chief warrant officer who is now in his 20th year of leading the acclaimed Gloucester High JROTC program.